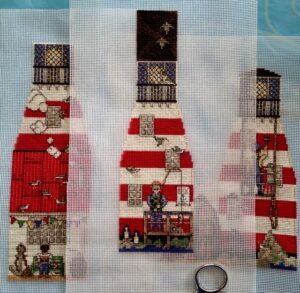 The stitching’s been slow but steady and I’ve now completed three sides of the next part of BrightSea Village. This piece actually appears in the stained glass window of the Wedding Chapel . No time to write more now. I’m too keen to get back to stitching the last side. This entry was posted in BrightSea Village on January 27, 2017 by Elli Jenks.